If the Oxygenator breaks down, I’ll suffocate. If the Water Reclaimer breaks down, I’ll die of thirst. If the Habitat breaches, I’ll just kind of explode. If none of these things happen, I’ll eventually run out of food and starve to death. Of course, I’m by no means an expert on Martian survival. However, this book seemed very, VERY realistic. Whether in fact, it is realistic, I cannot judge. As long as it doesn’t have any flaws that are immediately obvious though, I like it. And well, this book didn’t have any obvious flaws. The character of Watney is amazing. He is so creative in finding solutions to his problems, as well as smart. Of course, like with any normal person, not all of his endeavors succeed, making the experience more realistic. His love for ductape is also notable. The only thing I felt was lacking, was the difficulty of dealing with being alone for such a long time. Usually, people get at least a little weird, if not go completely insane. However, Watney doesn’t seem to experience any of that. Besides that, his humor, frustration and independence are amazingly realistic. 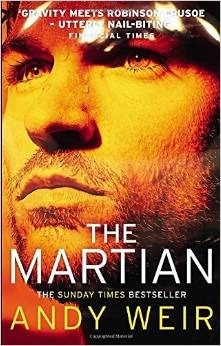 The plot is fairly simple: man stranded on Mars needs to survive till rescue comes. However, the story is complicated because of political, personal and technical difficulties, making it a very fascinating read. Up until the end I wasn’t sure if he would make it or not. That only becomes clear in the last pages; I found that quite exciting. Definitely a book I can recommend to anyone.